KeyMe transforms the way you manage your keys, for the first time putting you in control of when and where you can access them. 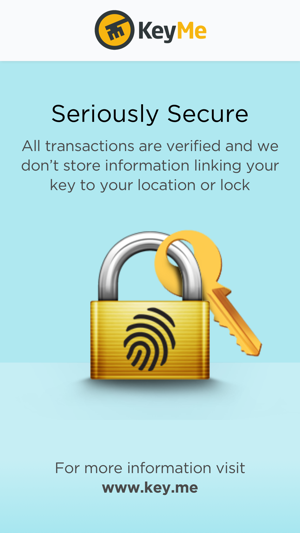 - Save: Scan your key using the app and securely save a digital copy in the cloud. - Copy: Order a duplicate in the mail, or pick up most keys at your local KeyMe kiosk. 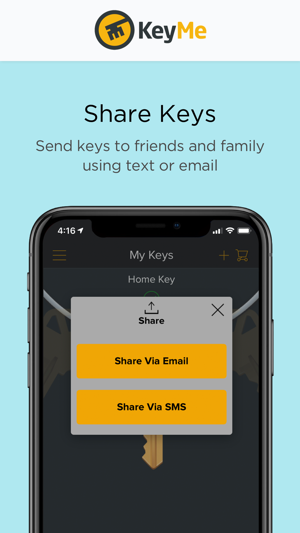 - Share: Easily share your key via email or text with roommates, friends and family. - Solve: Access and print your saved key when locked out at any kiosk nationwide. Or, call to find a trustworthy locksmith whenever the need might arise. 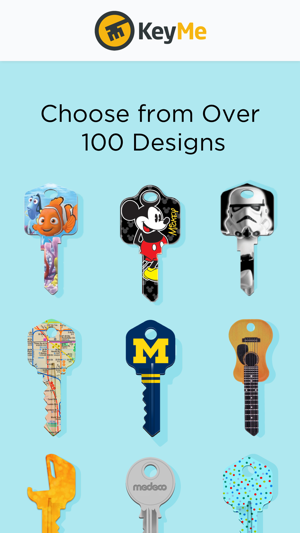 - Personalize: Choose from over 100 designs to make your key truly unique. - We cannot accept pictures of your key. We require a physical key to perform a scan. - We do not copy keys marked for educational or government use. 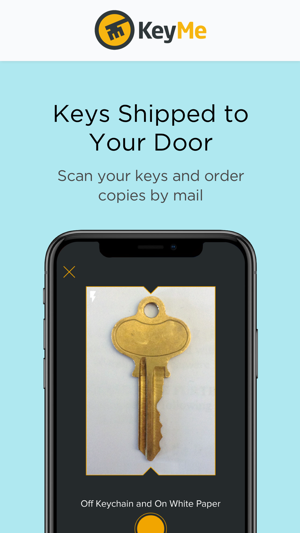 KeyMe is a New York City-based startup transforming the way people access and manage their keys. 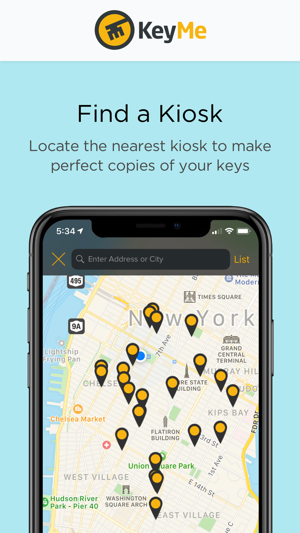 In addition to mobile apps, KeyMe has automated key copying kiosks in local retailers including: 7-Eleven, Bed, Bath & Beyond, Kmart, Lowe's, Stop & Shop, Rite Aid and many more. I have literally never written a review for an app but KeyMe saved me this weekend so I knew I had to say something. This weekend I was just coming back to NYC from a week long trip to Mexico and realized at the airport that I left my jacket with my apartment keys back in Mexico. I had no idea what to do. The management office of my apartment was not open on the weekends and my parents who have a copy of my key were out of the country and my sister who has a key was 2.5 hours away. As I was sitting there at the airport thinking about how I was going to have to break into my own apartment, I realized that months ago I had made a copy of my apartment key for my sister using KeyMe and therefore a copy must be stored at one of the kiosks! I went to one of the kiosks, which are pretty much at every 7Eleven, and was able to make a new copy of the key and get into my apartment easily. Thank you so much KeyMe ! There is no real reason to make an account for this app/ company unless you want a specific design for one of your keys, but the mail-in ordered keys are also a crapshoot. I’ve ordered about 4 different keys for different locks and have two that work and two that they messed up. The kiosks that you can bring a physical copy of your keys to are very helpful, but a nightmare to try to pick up an ordered key at. I tried to pick up an ordered key because the app suggests that you can just scan a key and pick it up at any kiosk. It wasn’t until I tried that I found out that the process actually requires you to order the key and make the kiosk the destination for delivery. I found that out after being redirected multiple times struggling to navigate my way through the hapless customer service. The phone number provided at the kiosk to ask for help actually led me to the partner company that does the smithing for KeyMe, and the person on the other end had no idea what I was talking about. I then called the company and was redirected a couple times before being transferred to that same number which originally was no help. “Why not just bring the key in at that point?” Is what I was thinking, and I eventually did, only to find that most of the ones around me were not working and had not been in some time. Absolutely awful experience that KeyMe is falsely selling as a super convenient way to reprint keys. HUGE waste of time! KeyMe kiosk saved me a bundle! 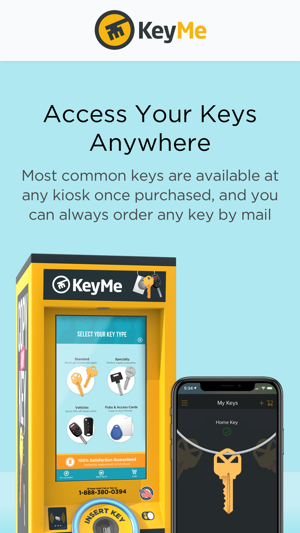 When I was in a lock out situation hundreds of miles from home where I had left the keys, the KeyMe kiosk saved me a lot of money that I would’ve had to spend on a locksmith. The phone app gives you the option of sharing a key via text or email, so my sister who was at home was able to take a picture of the key with her phone and have it sent to me. I was able to go to the kiosk and cut a copy on the spot, pretty amazing! The technical support people were very very helpful and even stayed after hours to ensure that my key had been approved to be cut at the kiosk. There was some confusion as you must have the key reviewed by a special team before you can have it cut, so make sure you let them know if you need the key immediately. Overall an excellent service!